Would you take a sidecar out for a Sunday blast? Who else wants to join the MCN staff on their sidecar tour? Mention sidecars in conversation and most eyes immediately glaze over. Sidecars are the preserve of old boys, they are impractical and boring – or so they say. I would have agreed myself, but after spending just two days with an outfit I’m now saving up to buy my own… Here’s why you should too. 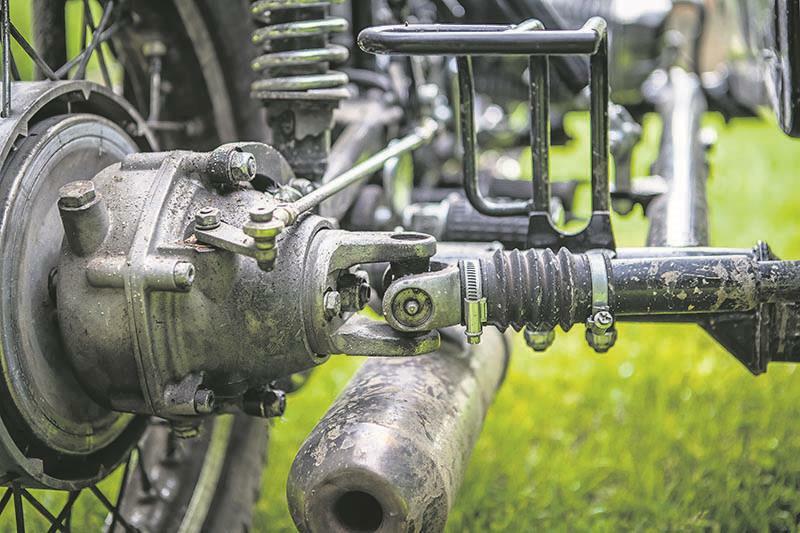 For the last 50 years three-wheelers have been dismissed as uncool, but it wasn’t always that way. In 1951 less than 10% of British households owned cars while no fewer than 150,000 outfits whizzed along our roads. But as cars became more affordable sidecar sales rolled off a cliff, deemed obsolete and out of tune with a modernising society. Well, we reckon it’s time for a comeback because sidecars had lots going for them over 65 years ago and still do today. They are cool, rugged, supremely practical – and take far more skill to operate than you might imagine. But once you’ve got the knack of it they transform into incredibly capable and versatile machines. You can take your family touring around Europe, tear up the countryside with one wheel in the air, have the best time of your life with your mates, race on and off-road, become a dirt track warrior and even go on a global adventure with a trusty outfit. Isn’t it time you considered one? This right-hander came out of nowhere. The bars are at full right-lock and we’re veering over the white lines into the wrong lane. The sidecar starts to gravitate, my passenger throws his upper body half out of the car in a desperate attempt to stop it lifting off. It doesn’t work. We’re now in the wrong lane. Ten seconds ago we were cruising along gorgeous twisty roads through the Austrian hills. 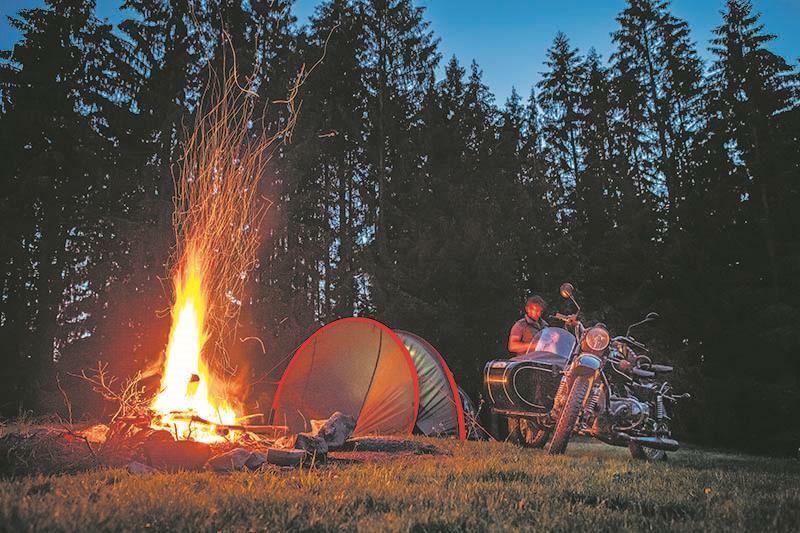 It was peaceful, with only the sound of birds and the put-put from our 750cc Ural outfit in the air. But unless I can conjure up a miracle or, even less likely, some skill, it’s about to become a site of carnage. Being in the wrong lane is no longer our primary concern. The outfit won’t turn at all and we’re now heading for the cliff edge. My 10 minutes of sidecar training go out the window and my motorcycle instincts kick in. I grab a fistful of brake, but that only yanks the bars further left and straightens us up for take-off. I glance at my passenger as if to apologise for what’s about to happen. I can just make out his eyes through the thick fog of fear steaming up his Perspex goggles. We both scream expletives, shocking my delayed brain into realising this isn’t working and forcing it to make the psychological break from solo to sidecar. I unwillingly get on the gas. My senses scream, convinced that throttling on will accelerate us off the cliff and deep into the forest below. My soul cringes as the unit snaps right and the rear wheel tickles the edge, pushing rocks into the pit below like a 10p arcade machine. We shoot back to our side of the road, embarrassed, out of our depth, our faces white and hands shaking. No one says a word. I always thought sidecars were for gentlemanly folk from the 1950s, and Wallace and Gromit. Nobody told me a sidecar would provide the most exhilarating ride of my life. At the Ural headquarters in Austria we met the MD, Hari Schwaighofer, and a fleet of rugged Soviet-era outfits. After a quick introduction to driving, my passenger, Adam, loaded our gear and jumped in. James, our photographer, got in Hari’s outfit and we all set off. I was expecting a gentle ride on a rickety old machine from a bygone era, the next two days would slap that stupid idea completely out of my mind. Hari, an ex-sidecar motocrosser, started us off with straight lining on a dual carriageway. He seamlessly flitted between traffic while my stubborn old mule snapped to the right every time I accelerated, my left arm continuously working to bring it back in line. If I braked or rolled off she’d flick to the left. I was all over the place. I could feel Adam looking at me like I’ve never even touched a motorcycle before. The Russian didn’t care what I wanted; she had a mind of her own. Hari got bored after 10 minutes and veered up a dirt track into the hills. So, armed with 20 minutes of practice, I found myself chasing a nutcase through a forest on a machine that hated my guts. The ground turned to slush and the rear wheel snaked like a serpent in wet mud. The right embankment rose, kicking up the sidecar and bringing my passenger’s head uncomfortably close to mine. I couldn’t believe how Hari was barrelling through this terrain on the big Ural, his three-wheeler ploughed through like a bulldozer. Mile after mile of stunning roads should have given me time to get used to driving, but it wasn’t enough. My brain rejected the outfit’s counter-intuitive handling. It’s nothing like riding a bike, or driving a car. When you accelerate the unit goes in the direction of the sidecar, and as our model is on the right (we can only get them on the left in the UK), the unit pulls right, which means you need to be prepared to steer left to counter it. If you accelerate too fast round a right turn the sidecar wheel wants to lift. Going left, the rear wheel feels like it’s floating if you go too quick, and the whole thing can end up flipping. Simple tasks like changing gear make the outfit shake and feel unstable. Anything over 40mph and it turns into a wrestling match; if my aching shoulders gave up, the Bolshie beast would win and spit out a passenger. On two wheels we’d be lacing beautiful twirls of tarmac together into pretty bows. But with three wheels, it’s all about surviving each bend as she tries to spit us off. Hari helped us find a spot to camp for the night. I held a brave face while we unloaded the humongous 83-litre boot. Hari bid farewell and left me with a warning: “If you thought it was hard with a passenger, wait until tomorrow when you have a pillion too.” As he drove off, my brave face dissolved and my shoulders collapsed from pain. I have a new-found respect for sidecar riders and wouldn’t want to arm wrestle any of them. As Hari’s parting words settled in my brain, a potent concoction of apprehension, adrenaline and pure exhilaration moved in with them. The next morning, everything began to feel more natural. My achy arms forced me to rely on the throttle for turning right, and lefts were tackled by throttling off and applying the brakes. I wish I had practised it sooner. Burying it into lefts had James yelping: “The rear’s coming up, we’re going to flip!” and had us all hanging off like racers. But by the end of the day mortal fear was replaced with non-stop giggling, pure exhilaration and camaraderie. As the mighty Ural flew over ruts and ravines and waded through rivers, it dawned on me how good an overlanding machine this is. Weeks later, the sensation still writhes inside me. I sporadically laugh, wince and nearly cry thinking about it. None of us wanted it to end, and not once did any of us want to be on a bike. 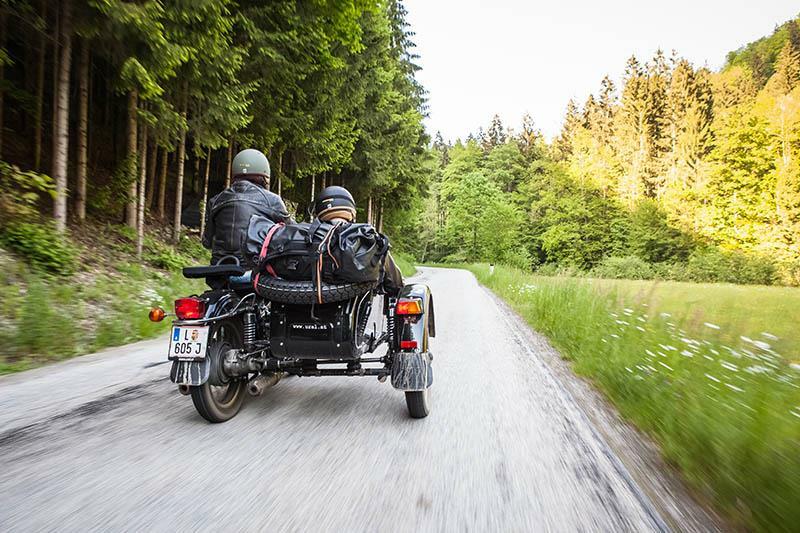 The sidecar isn’t a solo endeavour like a motorcycle; it’s about having an adventure with your mates… and not crashing. And once you’ve got the latter nailed, it’s the best fun you can have on any amount of wheels, ever. Why not browse sidecars for sale today!